Father's Custody Rights, Visitation, and the Arizona Laws About Fathers and Their Children. Are you a Dad who wants more time with your kids? Are you being denied parenting time by the Mother? Are you wondering what your rights are? The first thing you should know is that there is a difference between your rights as a Father when you are or are not married to the mother. Juvenile law governs the rights of unmarried Fathers who have not gone to the family court to establish rights. Family court governs rights of married fathers who are getting divorced and also governs the rights of unmarried fathers who file the paperwork to establish paternity and custody (legal decision making and parenting time). No matter what your situation is, if you need the help of a court to establish your rights or to determine your rights, you will need to understand the “best interest factors” which is what the courts look at to decide “custody” (legal decision making and parenting time). If you have questions or are considering divorce or establishing your Fathers’ rights, please call and schedule a consultation. In Arizona, if you are a married father, there is a legal presumption that you are the biological father of the child. This means you are presumed to be the legal father of the child and paternity is already established. You have a legal right to the child and to participate in major decision about the child, such as medical treatment, education or religious training. Being a married father comes with responsibly as well in the event of a divorce, particularly regarding the establishment of child support. In Arizona the law recognizes the equal rights of fathers during separation and divorce. The fact that you might have worked full-time during the marriage to allow your wife to stay home to care for the children will not be held against you when it comes to determining legal decision-making and parenting time. Courts in Arizona no longer follow the “tender years doctrine” where mothers were favored when it came to determining parenting schedules for young children. Both mother and father are viewed equal in the eyes of the law and either may qualify for primary residential parent. The courts cannot favor one parent over another and must take the facts of each case into consideration when they make a decision. Courts and parents should both focus on the children’s best interests. 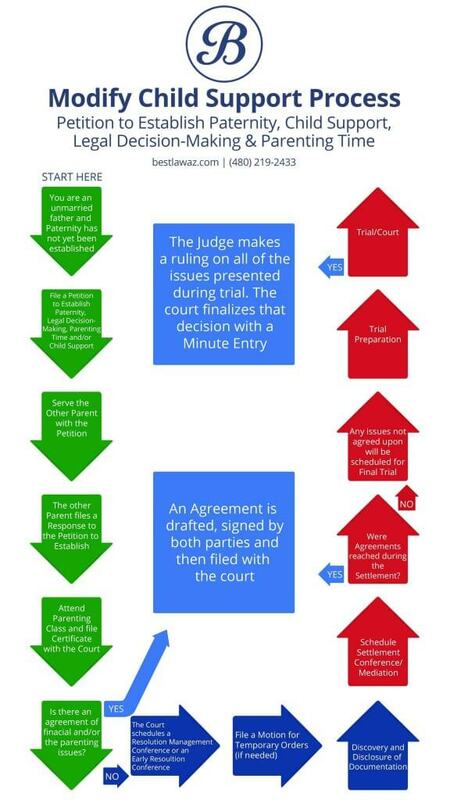 In Arizona, a father who is not married to his child’s mother has no legal right to the child until paternity has been established, either by agreement (affidavit between the parents) and a written agreement or a court order outlines the schedule and decision making ability of each parent. The unmarried mother can make significant decisions with regard to the child’s medical treatment, education, and religious training all without the father’s consent or even seeking his approval, unless or until he seeks to gain his rights. Imagine a situation where a father takes his child to the park. He watches her go down the slide and pushes her on the swing. Suddenly he hears a siren behind him and a police officer approaches him asking for his name and ID. He is arrested and informed that he is being charged with custodial interference. The police take his little girl away from him, and they take her back to the mother. The parents had an argument that morning and she called the police to get her daughter back. Legal? It might be if the parents are unmarried. In Arizona, a father who is not married to his child’s mother has no legal right to the child until paternity has been established. When you establish paternity you must also establish decision-making, parenting time and child support. You cannot establish paternity without establishing all of the other legal rights related to your child. The parents voluntarily acknowledge paternity by signing an affidavit. The father does not file a response or appear in court. The father files a response admitting paternity. The court orders genetic testing and the test reveals that there is at least a 95% likelihood that he is the father. The court orders genetic testing and the father does not take the DNA test and does not have good cause for failing to do so. My girlfriend just had our baby. We are not married, what are my rights? You have no parental rights until paternity is established. That does not mean, however, that the Father should be denied time with the child. A later determination about disputed custody will include the court reviewing how each parent treated the other parent with regard to access to the baby or child. If a parent denies the other parent time with the child for no good reason, it will be reviewed at a later date regarding custody. Good reason could include domestic violence, drug abuse, mental illness, criminal behavior or child abuse. If I obtain paternity does that mean I can be required to pay child support? Yes, it will. Every parent must pay for their children, whether they live at the house or whether you must pay the other parent who cares for them. Can we do this without the court? Yes, you may be able to draft a legally binding agreement, signed by both parties, without filing it with the court. It is not however, a court order unless a Judge signs off on your agreement. My name is on the birth certificate signed by the hospital staff; doesn't that prove I am the father? Not as long as he/she is a minor. Arizona law allows parents to establish paternity anytime during pregnancy up until the child turns 18. Yes, you can find the necessary paperwork on the Maricopa County website. Can I really be charged criminally for having possession of my own child? Yes, it is possible if you are the unmarried father and there are no written agreements or court orders in place. Is it free to submit this paperwork for the state? No. The state charges a filing fee depending on what paperwork is required to prove paternity. However, if you cannot afford the filing fee you can request a waiver from the court.